Keep reading for some detailed guidance on each of the above three points. It goes without saying that if you’re trying to make a career for yourself in music, you’ll be in competition with thousands of other talented bands and artists who are hoping to do the same. Whilst this might come off as discouraging, I firmly believe that standing out from the crowd is nowhere near as difficult as you might think. Write lyrics with the listener in mind: Listeners connect most strongly with songs that effectively take the words out of their own mouths. More often than not, the greatest lyrics are simply-put and highly-relatable as opposed to being convoluted or overly-wordy. 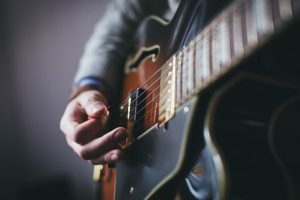 Study other great songs: Studying other songs that have seen success is a fantastic way to pick up new techniques and retain your inspiration for writing new music. When you’re studying a successful song, break it down into the core elements and ask yourself how and why it works. Does the second chorus come around faster than the first? What do the backing vocals add? How does the drum pattern liven up the bridge? Seek out & implement honest feedback: This step is easier said than done. When seeking out a mentor, you’ll want to try and find someone who will give you honest, constructive criticism without conflict of interest. Whilst asking your friends or family might seem like a logical idea, keep in mind they’re likely to simply tell you it’s good to avoid hurting your feelings. Be ruthless: Whenever you write a new song, make sure you question every aspect of your work. Ask yourself what each line of the song means and how it fits into the wider interpretation of the lyrical content. If you’ve repeated a section, ask yourself what the repeat actually adds. Make sure you only release the absolute best work you have; You might’ve spent forever pouring over a particular song, but don’t be afraid to scrap it if it doesn’t measure up. Quality is much preferred over quantity. Both a strong sonic and visual identity is required in order for both audience & industry to clearly distinguish and connect with your project. If you’ve ever heard a song for the first time and instantly known which band or artist wrote it, it’s because they’d achieved a fully-realized sonic identity. A fully-realized sonic identity is primarily composed of a consistent, identifiable genre and a set of signature traits. Many bands (especially on their debut release) tend to hop drastically from genre to genre over the course of an EP or album. Whilst it’s good to experiment with a few different styles, it’s worth trying to hone in on a set genre in order to maintain a sense of consistency and better appeal to a more focused audience. Signature traits are where you can really set yourself apart from the crowd. 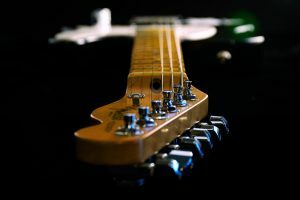 They can come in the form of distinct guitar tones or techniques, vocal styles or even particular song structures. I’d recommend asking those who have heard your music what particular traits set you apart from other bands or artists. Once you’ve done that, you can start to leverage them. It’s natural for your sonic identity to evolve from release to release, but it’s important to try and retain a sense of overall consistency on each individual release. Visual identity, whilst arguably the most important aspect of independent music marketing, is all too often underestimated by independent bands and artists. Whilst it might be a difficult pill to swallow, both audience & industry are looking for charismatic, personable and good-looking artists with an ability to engage & entertain. Think about your own motivation for wearing merch from a band you love. 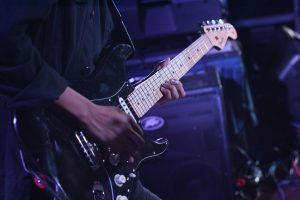 You aren’t just publicly showcasing your interest in that band’s music, you’re communicating a set of cultural values, personable traits, hobbies and interests that the band effectively represent. Make sure your branding exudes a personality: When designing your artwork or logos, think how the color, font & overall design can contribute to your visual identity. Make sure your promotional pictures convey who you are as a person: Think how your appearance, clothing, facial expression and the setting of the pictures might do this. Leverage your own personality through your marketing efforts: Instead of composing robotic and boring social media posts, inject a sense of personality into what you have to say. Your audience want to know they’re connecting with a fellow human and not simply a marketing machine. If you’re playing a show, speak to as many people as you can at the venue and let your personality shine through. People buy people, not products. Take a regular & ruthless approach to rehearsing: Rehearsing on a regular basis will ensure the consistent development of your skills and abilities. When rehearsing, you should be nothing short of ruthless when it comes to getting the material as good as you can get it. If the drummer came in a millisecond late, do it again. If the vocalist didn’t quite make that top note, do it again. These things may seem small, but they’ll stick out like a sore thumb to an audience. If you’d like some actionable advice on effective rehearsal, check out our article ‘20 Band Practice Tips That Actually Work‘. If you’re just starting out, play live at every opportunity: As ruthless as you might be in rehearsal, nothing will hone your live skills like playing shows. If you’re just starting out, play anywhere and everywhere you can for the sole purpose of gaining experience and honing your skills. You will undoubtedly have bad shows here and there, but these should be seen as a necessary opportunity for you to improve. Once you’ve gained ample experience, only then can you worry about being more selective with your live appearances. Play as many shows as you can outside of your hometown: Playing your hometown over and over again will bore your local audience and limit your potential to expand your fanbase. Join a dedicated Facebook group for live music and begin contacting promoters. Leverage your visual identity: Remember what I said about audience & industry connecting to charismatic, personable and good-looking artists? This is a perfect opportunity to take advantage of that. Have a lively stage presence, implement a dress code and charm the audience in-between songs. You are owed nothing: Many bands and artists make the mistake of thinking they’re entitled to floods of engagement with their music purely because they’ve worked hard to produce it. The bottom line is that other people owe you absolutely nothing unless you’ve given them a reason to. With that in mind, focus on providing as much value as you can to other people instead of expecting them to provide you with value from the get-go. The music alone is not enough: To repeat what was said in regards to visual identity, both audience & industry are looking for charismatic, personable and good-looking artists with an ability to engage & entertain. In addition, they are looking for someone who can actively add value to their lives without expecting anything in return. Be consistent in everything you do: You might make a great impression on a potential fan or an industry operator, but they will quickly forget about you if you aren’t consistently getting in front of them. Allocate a distinct role for each channel: Copy-and-pasting the exact same message on every social media platform bores your audience and comes off as spammy. In addition, it fails to take advantage of each channel’s unique tools & features. Take the time to study how each channel works and allocate different aspects of your overall promotional efforts accordingly. Leverage your visual identity: Remember that people buy people, not products. Your fanbase will want to form a personal connection with a human being, not a marketing machine. Post a diverse range of content on a consistent basis: In today’s saturated social media market, people expect to be constantly entertained and engaged. Creating a diverse range of content and posting it on a consistent basis will keep your audience actively engaged in what you have to offer. Take an active interest in your audience: The most valuable asset any of us have is our time. If someone is giving you their time, treat it with respect and make it worthwhile. Take an active interest in your audience; get to know them, ask them about themselves and make them feel valued. For more help with online marketing, check out our article on how to promote your music successfully on the internet. Take an active interest in the industry and make yourself known: Start going to other band’s shows as an audience member and sharing their work on social media. Start going to industry events on a regular basis and learning as much as you possibly can. Forming relationships in-person is often much more effective than forming them online. Go above and beyond for others without expecting anything in return: Be that person who does the things that no one else is willing to do. If you’re going to another band’s show, turn up to the venue early and help the them load in. Sing along during their set and consider buying some merch. If you’re at an industry event, do some research on the industry operators beforehand and ask them about their career. I’s imperative that you do this without directly expecting anything in return; people will see straight through you if you’re simply doing something for your own benefit. Be patient: When you form personal offline relationships with industry operators or fans, you’re essentially planting seeds that will flourish further down the line. It might be months or even years before you start to see the payoff, but keep at it on a consistent basis and you’ll undoubtedly experience success in some form. Plain and simply, things won’t get done if you don’t put the work in. Whilst many bands and artists complain of a lack of time when it comes to working on their music, it’s often in fact a lack of proper time management. If you don’t feel like you have time, you’ll have to make time. Consider giving up that Saturday night out drinking or that Wednesday night binge-watching Netflix in order to work on your music. Treat it like a part time job: Make time each day to work on music, learn about the industry, rehearse your material and post on social media. Create a social media/gig schedule and stick to it: As previously mentioned, people expect to be constantly engaged and entertained in today’s fast-paced, disposable culture. Create a schedule for your social media content and your live shows (and stick to it). It amazes me how many bands and artists will spend years taking the exact same approach to writing, recording and marketing their music, then wonder why they keep running into the same problems. With everything you do, it’s important to take time to reflect on what went well (and why) as well as what you could have done differently (and why). Don’t be afraid to take your failures on the chin and see them as an opportunity to improve for next time. In addition, don’t get complacent with things that went well. Take time to understand the reasons why something went well and decide how you can leverage that knowledge in the future.